An earthy facial mask that cleanses, detoxifies, exfoliates and nourishes the skin, giving back its radiance and good health. 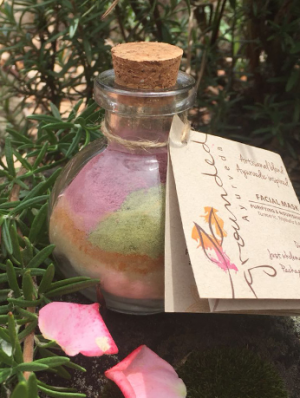 Artisanal blended with a perfect combination of medicinal spices, aromatic herbs, flowers, roots and Australian clay. A beneficial ayurvedic recipe that will awaken your senses and connect with mother earth, leaving behind the side effects of synthetic and chemical preparations. The Organic Ayurvedic Spice “Starter” Kit contains six of the most used spices in Ayurvedic cooking: Cardamom, cinnamon, cumin, fennel, black mustard seeds & turmeric. 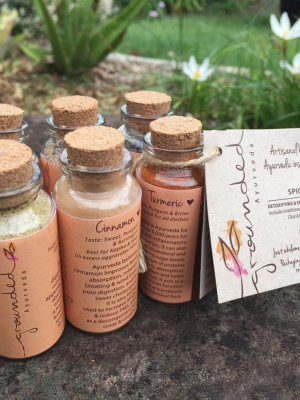 The spices come in individual designed glass bottles with the ayurvedic health benefits written in each one of them. On the back of the tag, together with the spice kit, you will find two detailed ayurvedic recipes to start your journey into ayurvedic kitchen and its healing properties.